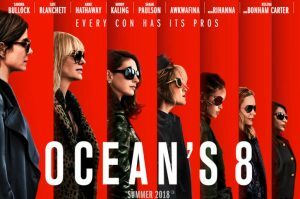 Ocean’s 8 is the newest movie in the Ocean’s franchise that started with Ocean’s 11 (2001), starring George Clooney, and this one stars Sandra Bullock as Debbie Ocean, the sister of Danny Ocean from the originals. It’s about her pulling off a heist in which she has to steal a diamond necklace from the Met Gala off of Daphne Kluger (Anne Hathaway). The team she recruits includes Sarah Paulson, Cate Blanchett, Rihanna, and Mindy Kaling, among others. 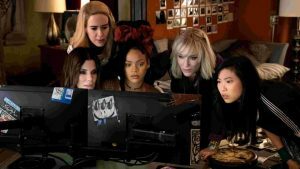 I have pretty mixed feelings about Ocean’s 8: it’s an overall light, entertaining movie with good performances and interesting camerawork, but its predictability and lack of suspense drag it down. Overall, the performances are great. Sandra Bullock does a great job as the star of the movie. She really sells her character and is fun to watch onscreen. Anne Hathaway is funny and gets more than just one dimension to her character. She seems like just a superficial villain, but gets more to do in the plot. The rest of the crew all give solid performances and play up each of their personalities well. The character interactions are also super fun to watch. They play off each other well, and the group has good chemistry that makes the central heist more entertaining. Their dynamic and chemistry is crucial to the movie, and luckily it works really well here. However, none of the characters get much development or dimensions to their character besides maybe Anne Hathaway’s character. All of them are entertaining, but still feel very one-note. Debbie Ocean gets some backstory, but besides her and Daphne, there’s not much to the characters. 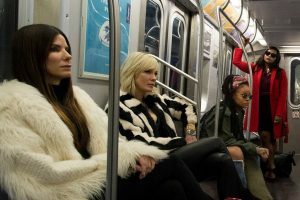 Visually, Ocean’s 8 is stylishly shot, has good costumes, and a very polished look overall. It almost imitates Steven Soderbergh’s style from the original, but given how good-looking his camerawork was there, it’s not really a complaint. The framing of some shots is clever and goes with the slick feel of the movie overall. As far as the plot goes, the heist section is entertaining for the most part, but it lacks a lot of suspense. There are barely any obstacles for the crew to face, and there was maybe one moment in the actual heist where i felt tense. Everything else goes exactly to plan for the crew, which loses any sense of suspense in what’s supposed to be a thrilling, exciting heist. Additionally, there’s no real villain in the movie. There’s no one to root against, like Benedict from the original Ocean’s 11, and this removes any motivation for the heist. The other reasons that the characters are doing it aren’t well explained, and the lack of a drive makes it harder to care about the heist. Ocean’s 8 doesn’t really subvert your expectations either. It’s very reliant on the heist movie formula and feels too similar to the original to stand out. Some aspects of the movie are switched up, but it’s pretty predictable in most parts. It also requires a bit too much suspension of disbelief at some points; while this can be expected from a heist movie, this movie gets very unrealistic in one specific part. 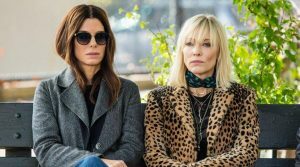 Overall, Ocean’s 8 is a breezy, but definitely flawed heist movie that can be very entertaining, but lacks substance. It’s well-shot and mimics Steven Soderbergh’s style from the original, which is a big bonus. The performances and chemistry of the crew is all great, with Anne Hathaway as a big standout. However, the movie fails to do much new with the franchise or genre and comes up short on the original in terms of its suspense and villain.